"Are You Looking to Get Started in the Share Market - or to Improve Your Current Performance?" The easiest way to learn to trade is to have someone take you, step by step, through a series of trades. You then learn their complete trading strategy, entry, stops, exits and why and how they act/react to price moves. Jim Berg, Expert Trader & Investor & Author of 'Shares to Buy & When' has over 30 years market experience, 18 years as a professional advisor. In December 2007, Jim warned his Report Members of the potential for a crash or Bear Market - BEFORE the falls of the GFC. Jim also closed his Report's notional portfolio - before the August 2015 falls. 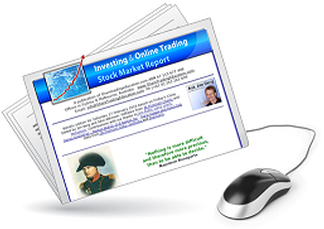 all designed to help you develop into the best investor or online share trader you can become. This online Report is published weekly. Select above to order the latest Single Edition or the next 4 Editions. * You will receive only the number of Editions which you order & will not be charged later for any further Editions. * We receive orders from Isubscribe every Monday and will email your latest Edition to you the same day. The combination of sensible education and real-world experience of what can go wrong - as well as right - looks to be unique. A most absorbing, comprehensive and informative newsletter. Well worthwhile for both traders and investors. Thanks for the freebee first edition of your newsletter . All I can say about it is that there is no surprise. Your never-ending output I find personally inspiring and I am always amazed at what you guys do/produce. Therefore I was not surprised that your newsletter was at a standard of excellence – just great to see. Congratulations.